Frost (so called because he wrote a poem that won a competition) struggled to make friends at his new school after his parents divorced and he moved, but he now has a solid but small group. Bench is an athlete who doesn't often play and who has trouble identifying with the jocks, DeeDee is a Dungeons and Dragons fan, and Wolf is a very talented musician. All the boys fall on the geeky end of the spectrum, but because there is safety in numbers, are usually left alone, with the exception of the occasional "nudge" in the hallway. Perhaps this is why a new student, Rose Holland, is drawn to their table in the cafeteria. Rose is a large girl and seems unafraid of everything and very confident despite the immediate barbs from others. When she brashly asks to sit at Frost's table, the boys are too surprised to say no, and an unlikely alliance begins. Rose and Wolf especially hit it off, DeeDee is impressed with her gaming skills, and Frost finds that she is an amusing companion. The problem is that she has changed things, and Bench no longer hangs out with the group. At the same time, cell phones have been banned at the middle school, so students are finding other ways to communicate. It starts with a few sticky notes, but soon nasty things are being said. Rose is a target of some of these, and the notes seem to be coming from some of the boys on Bench's team. Bench grows even further away from the group. After Rose saves DeeDee from one of the boys and dares him to ride his bike down a local hill ("The Gauntlet"), and makes the ride successfully herself, Frost hopes that things have changed. Rose demands that the boy wear a sticky note that says "I'm sorry" all day even after the notes are banned, but there is a note after that that is particularly hurtful, and which threatens Frost's comfortable world even further. Anderson manages to combine laugh-out-loud lines ("It's wombats, actually. And I don't wrangle them. I groom them for professional wombat breeding competitions.") with a fresh and compelling twist on middle school problems. The desire to find a safe group is not addressed enough in middle grade literature, and Frost's concerns about the well being of his friends and the well being of their safe "pack" all ring true. 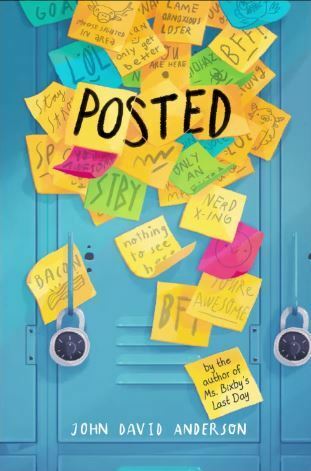 Even the bullying, which is a too-frequent topic in middle grade literature and usually handled in a boringly stereotypical way, is realistic, with snide comments and sneaky backstabbing taking the place of wedgies being given in back hallways. The characters are all wonderfully drawn and fully realized. If anything, Frost is the least developed, but this is mainly because he is still trying to figure out who he is. Rose is terrific, and if I didn't know better, would have thought she was inspired by one of my own friends growing up. It's hard for me to report on these characters objectively because, well, I would have been sitting at Frost's table in middle school. For years, I have felt proud of myself that my middle school lunch group was mixed gender (and there were six of us), but reading Posted made me realize that we were together because we were all safer together than apart. Certainly, readers who enjoyed the fantastic Ms. Bixby's Last Day will be quick to pick this up, but it's also a good companion for Weeks and Varadarajan's Save Me a Seat, Buyea's Because of Mr. Terupt, Palaccio's Wonder and other books that teachers are quick to use in classroom discussions but which their students love because of the quality of the stories and the passion that their teachers have for the books. This one would be a five star read for me if it weren't for one thing-- this is really two books. It's really long (369 pages) for middle grade literature, and the story of Frost's group of friends would have been perfect without the whole issue of the cell phones and sticky notes. Yes, the book made me cry a little, but I think that it would have been read more widely if it were a sparer volume on a topic that isn't as high profile as bullying. Here are the other stops on the tour. Can't wait for Posted to come out in May, thank you for introducing me to this author's work!